Wichita, KS — Braving sub-freezing temperatures and a wind chill hovering around -2° F, dozens of high school students from across Kansas sang hymns and knelt in prayer for an end to abortion outside of the South Wind Women’s Center abortion clinic in Wichita, Kansas this morning. The students were joined by Congressman Tim Huelskamp, who knelt on the icy sidewalk with them in prayer. A smaller groups of abortion supporters gathered across the clinic’s driveway and shouted, blew whistles, and shook noisemakers in an effort to drown out the prayers and hymns put forth by the pro-life throng. The contrast between the chaos that the abortion supporters attempted to create and the prayerful demeanor of the pro-life students was remarkable. 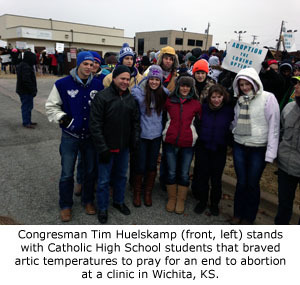 Several news reporters and cameramen covered the event, which was organized by students from St. John’s Catholic High School in Beliot, Kansas, who traveled 2½ hours to Wichita to rally and pray at the abortion clinic. High school students in states such as Nebraska, South Carolina, and Colorado are also participating in a similar Catholic School for Life rallies at abortion clinics in their home communities. The South Wind Women’s Center opened 7 months ago in the building that once housed George Tiller’s infamous late-term abortion clinic. Operation Rescue discovered evidence of financial malfeasance related to the clinic’s funding and filed the appropriate complaints. The clinic owner Julie Burkhart, remains under investigation.